Prof. Michael McDonald’s United States Election Project has released turnout estimates for 2018. 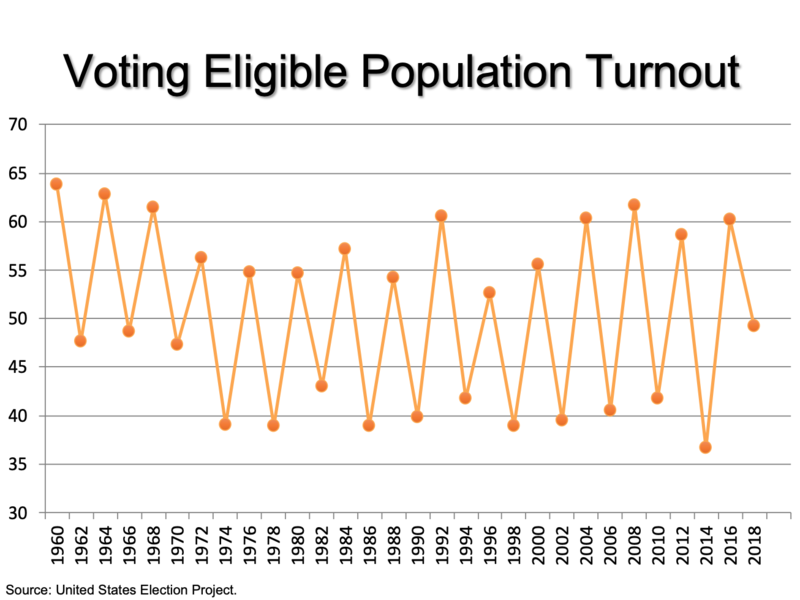 How does turnout compare to the past? How does Maryland compare to its sister states? McDonald’s estimates are for the voting eligible population (VEP) as opposed to the voting-age population (VAP). The VAP includes non-citizens and disfranchised felons who can’t vote, and excludes expatriates who can. VEP adjusts VAP for these differences, as the proper way to calculate turnout is voters/VEP, not voters/VAP. The immigration waves over the past few decades mean that failure to adjust leads to serious underestimates of voter turnout. As the graph at the top indicates, national turnout regularly rises in presidential elections and drops in midterm elections. But look at 2018. The 49.2% of eligible voters who cast ballots this year is higher than in any midterm since at least 1960. It’s a full 12.5% higher than turnout in the 2014 elections held just four years ago. Polarization in Congress has been increasing for some time. The injection of Trump into the political scene combined with the continued close division in the country has spurred similarly activated division in the electorate. At 51.1%, VEP turnout in Maryland was 1.9% higher than in the country as a whole. Maryland ranked 23rd among the 50 states and DC – not too bad for a state with neither a competitive gubernatorial nor senatorial election. On the other hand, education is highly correlated with turnout, so maybe Maryland doesn’t do so great for such a highly educated state. We rank third among states in terms of the share of residents with college degrees and second based on the share with advanced degrees. According to McDonald, the estimated 2018 VEP turnout of 51.1% for Maryland is fully 9.1% higher than the VEP turnout of 42.0% in 2014. It not only marks a reversal from the abysmal turnout of four years ago but also a jump 4% higher than the more typical 47% turnout in 2002, 2006, and 2010. 2020 really ought to be something.